I have been really distracted by my plans for WWII Normandy Campaign using the Chain of Command ruleset. So distracted in fact, that I have done very little work on my first submission for the Analogue Hobbies Painting Challenge. I have been looking at all of the submissions on Curt's blog with some embarrassment and although I have started an unit for the challenge, I just find it more interesting to work on terrain. I do have a battalion of Front Rank French Légere half painted but all those straps for some reason are not catching my imagination. I am putting together a terrain for what I am hoping will be a three scenario mini-campaign for Chain of Command. WWII skirmish wargaming is new to me, and after a couple of games I have figured out that terrain is everything in this genre. From looking at games on various blogs, I have been really impressed with those terrains where WYSIWYG. I like working on terrain and I thought this would be a nice challenge. Tom Ballou, a real aficionado of WWII wargaming introduced me to the Skirmish Campaign series of sourcebooks for scenario ideas for WWII. After having a look I decided to buy the Red Devils Normandy '44 book. The above schematic is from this book. These scenarios are designed for 15mm miniatures. I have 20 mm figures, so I initially increased the 2x4' terrain (each block is a square foot) by 50% (3x6'), but then decided for ease of construction that I would go with a 4x6' terrain. This is standard for Chain of Command, and since I plan to use 2" styrofoam for the base it just makes it easier. 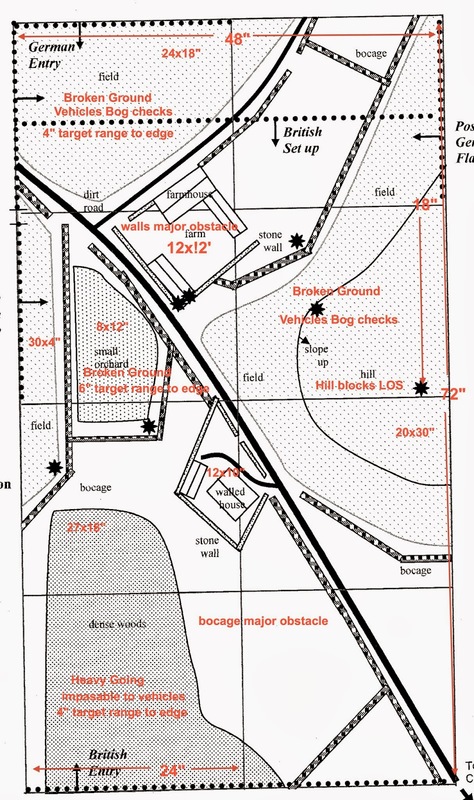 I found this schematic on line for bocage, it took awhile for me to appreciate just how big this was. As you can see the base is quite wide and the height of the bank itself is impressive. I decided to go with a scale that was around 4 times the height of a 20mm figure with a lot of variance. The picture at the top of this post suggests at least that. I also get the sense that the ratio of road width to bocage width is around 1.5. So here is the basic layout that I have done so far. It is laid out on a 4x6' Zuzzy mat, I will be using a purpose built sheet of styrofoam, I will model the hill required on the right into the styrofoam itself. But the rest of the terrain will be laid on. It just makes it easier for transport as well as making the terrain piece more flexible for further scenarios. I have a good chunk of the bocage done, but am still thinking about ideas on how to do the fields. 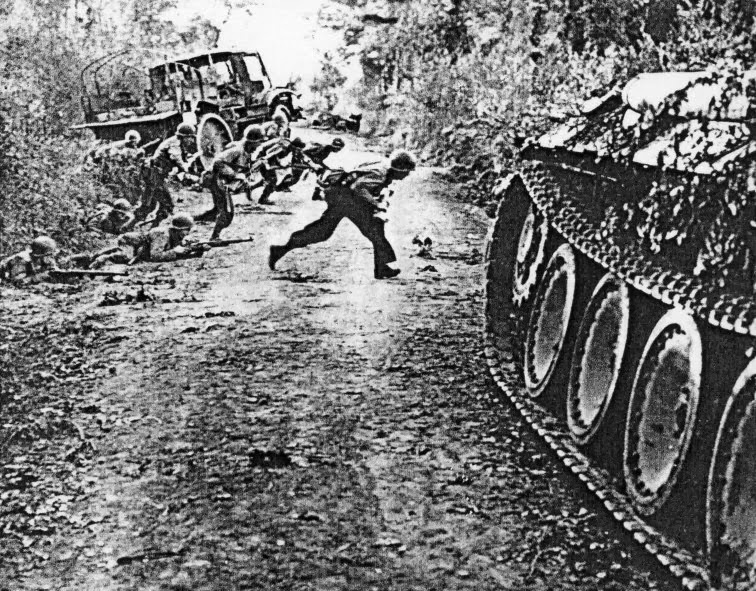 Ambush point with a Panzerschreck team just waiting for the Sherman. I like these fields. They are constructed using Zuzzy mat pieces which have been painted with these really neat Leafy Strips I got from Tajimal Miniatures in the UK. They are great for modeling rough ground, but I really need to find something different to suggest that LOS is blocked. It is too bad they do not make a taller product because these self adhesive strips were a breeze to apply. I have really enjoyed our Eastern Front games, but I think the ability to lay smoke is really fun, so I have my 2" mortar team already. I am hoping I have the correct look with my bocage. Time to get back to the Légere I believe, before I completely embarrass myself! Terrain is certainly a distraction when you are supposed to be painting figs - I can sympathise! I really like the bocage. Nicely done. Every time you post up on C & C, I want to give it a spin. This will be a 2014 project. Thanks for the inspiration and keep it coming! Splendid pictures, the terrain is beautiful! I am an absolute fan of the SkirmishCampaigns books. Have not played any of Red Devils yet, but leafing through it, it sure seems like one of their top books! What are your experiences using it for CoC? I am never 100% sure the SC books are suitable for CoC with their fixed themed games. Looking very good! Consider putting some trees into a few bocage bits to make it more uneven. Also consider building a few with the air filter material. Stacked horizontally to vary the width of sections a bit. Modern bocage is trimmed back by machines on roadways, but in pre-war times I think it was just broken back by carts. Great looking bocage John - I think you've got those massive hedge mounds that lined every lane and road spot on! I'd imagine it'd be a nightmare for any attacking force too. Time to de-stress and paint some pretty Legere! ...and may the dice gods smile upon you in 2014!